Visit the best preserved Ancient Roman Port with our official tour Guides. 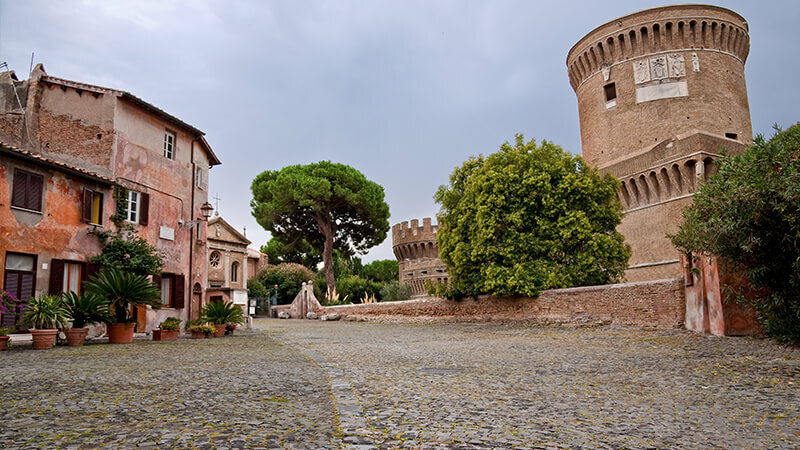 Ancient Ostia Tour – Depart from Rome with your guide passing the old Ostiense Gate, the ancient city walls erected by Emperor Aurelian in 270 AD and the huge marble Pyramid of Caio Cestius dating from 1st century BC. After 12 miles reach Ostia Antica Excavations situated at the mouth of the River Tiber on the Mediterranean coast and visit the maritime port of ancient Rome. Only rediscovered in the 19th century and excavated largely form 1920s to 1940s, Ostia was founded probably in the 7th century BC for salt extraction from marshy swamps but later in the 4th century BC it became a military and naval port protecting the Tiber access to Rome. With Rome‘s growing power it turned into a thriving and vital commercial port which for centuries imported wheat, grain, foodstuffs, luxurious exotic goods, spices, multicoloured marbles, Egyptian obelisks and innumerable wild animals for the amphitheatre games from Africa and Asia. The inhabitants were traders, shipbuilders, mariners, warehouse workmen, slaves, public officials and wealthy patrician families all busily engaged in intensive commerce and transportation over sea, river and land. Many of the freedman and slaves were of different origins, languages and religions: Greeks, Phoenicians, Iberians, Gallic, Egyptians, Frisians and recently a Synagogue dating from 1st century BC was unearthed. The superb typical Mediterranean setting of the excavations, covered with majestic umbrella-pines and cypresses, is as fascinating as Pompeii but without crowds and just 20 minutes out of Rome. 34 hectares have been excavated from the time it suddenly became a ghost town when an epochal flood changed the course of the Tiber. With intriguing and entertaining explanations recounted by your erudite guide you will experience how life was in this ancient sea-port, discovering various types of dwellings and tenement-flats (insulae) of the middle and lower classes and visit residences of the wealthy during your stroll along the network of intact streets. Ancient Ostia Tour – Explore, with our official tour guides, the interiors of temples, roman baths, shops, mills, taverns and public cloakrooms all with vivid mosaic floors, frescoed walls, stuccoed decorations and statues, rendering to the traveller a full idea of the teeming frenetic life of the port. Return to Rome by swift highway. At 09.00 a.m. (Suggested) or other agreed time. Ancient Ostia Tour rates per person include the above walking/driven tour plus air-conditioned Limousine, minivan or other means of transport, personal tour guide, driver, tax, skip the line entrances. 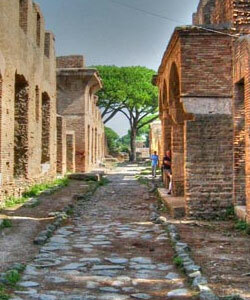 Ancient Ostia Tour is available only in limousine, mini-van or other means of transport. Privileged entrance. no waiting ! Ancient Ostia tour suitable for children, for disables if with wheelchair on request.